All items listed below currently for sale. Please email or call for prices. This is a wonderful small oval shaped Nantucket Basket, circa 1880-1910. It is in mint condition with a perfect patina. It measures 6 ¾” x 5” x 3 ½” deep. 19th century Chalkware Garniture. It is all original with no repairs or problems. Nice original paint and a large size of just over 13” tall. Hollow and lightweight. Here is an unusual 19th century Frakture Type Watercolor in its original paint decorated frame. It is a large piece with lovely geometric decorations at the top as well as the bottom. The wording is all done in German and when I showed it to a friend who reads a bit of German he said it was a poem for a house blessing. There is a bit of paper loss at the bottom but the rest is so strong it carries itself just fine. It measures a large 16 ½” x 25” including the frame. 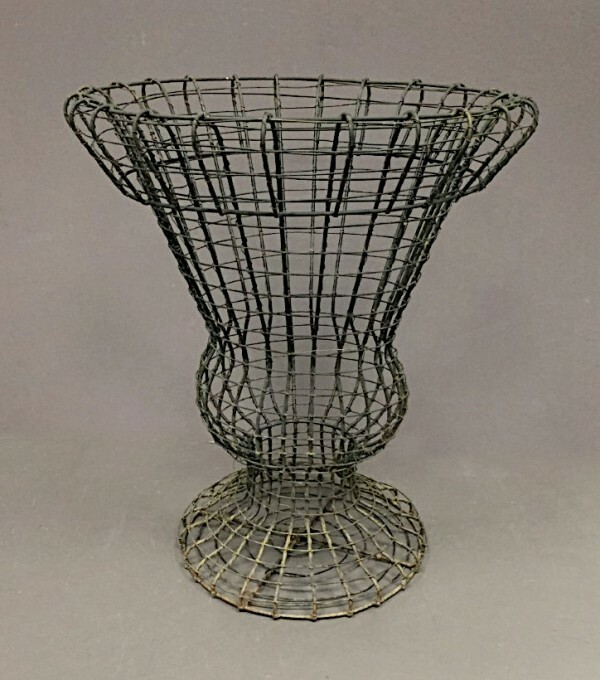 This is a large and very graphic late 19th or very early 20th century Wire Urn. It has an outstanding form, is in excellent condition, and stands 20” tall x 21 ½” in diameter. Sturdy! This is a 19th century game board in really nice original three color paint. This is a really good old board but this board has everything to do with the wonderful dry surface. It measures 19” x 27”. Ash Burl Bowl, circa 1800. This bowl has been in a local private collection for over 60 years. It has a wonderful form and measures approximately 8 ½” in diameter x 3 ¼” deep. I really like the tapered sides and the little footed area. It is in excellent condition with a beautiful patina too, never varnished. You can see in the photo that there is a small hole where a not fell out at some time long ago. Just part of the history. Here is an octagonal wooden Barber Pole circa 1900. It is all original and has a nice crazed dry old paint surface. It has the original iron brackets for securing it to the wall too. It measures 4” in diameter x 52” long. A great original American trade sign. Here is a wooden NO SMOKING IN THIS FACTORY SIGN, circa 1920. The lettering and decorative detailing are all done by wood burning. Every letter is filled in with tiny burned dashes. It measures 13” x 11”. Here is an American 19th century wooden Ship Diorama in its original paint. It has carved billowing wooden sails and we also like the light house in the foreground. It measures 25" x 19". 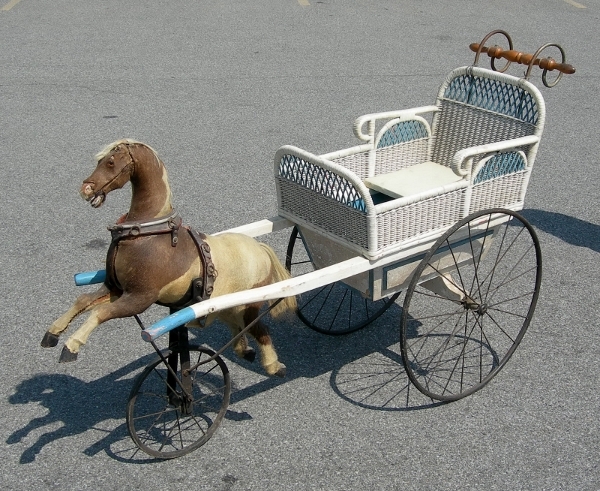 Extra nice 19th century Victorian DOLL CARRIAGE in its original paint and in very good condition. It came out of a Western New York collection and we were happy to be able to buy it. Really beautiful and complete. Check out the paint! 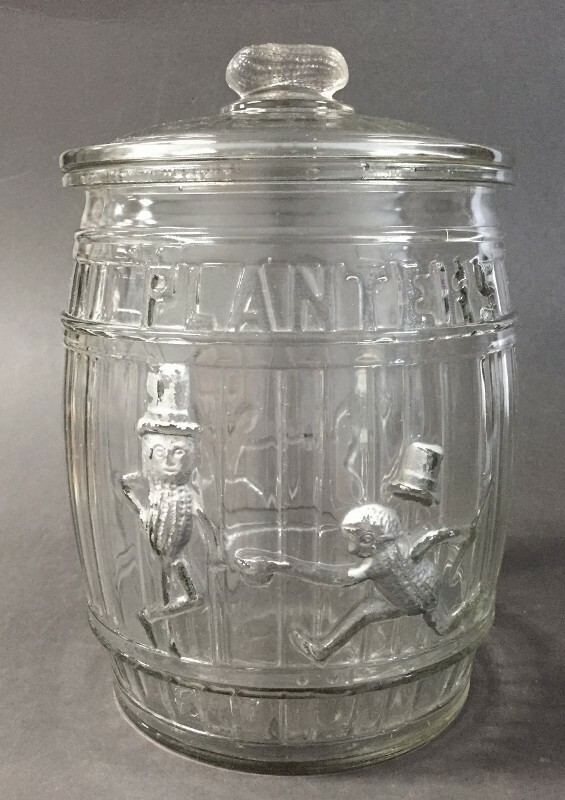 Here is an original country store Planters Peanut counter jar. This is the “Running Peanut Barrel” and was always my favorite of the different peanut jars. They do repro all the peanut jars but we guarantee this to be an original. It also has the original lid with a peanut finial. It measures 12” high to the top of the finial x just over 8” in diameter. 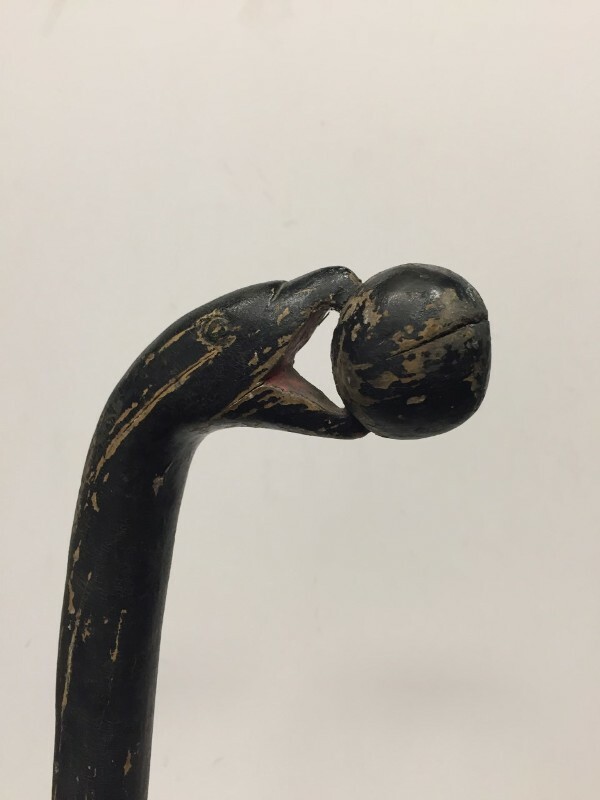 Here are two hand carved folk art canes that came off The Tonawanda Indian Reservation in Akron NY. One has a Dog Head Handle and the other is an Eagle holding a round object possibly representing the world. Both pieces are circa 1920’s. 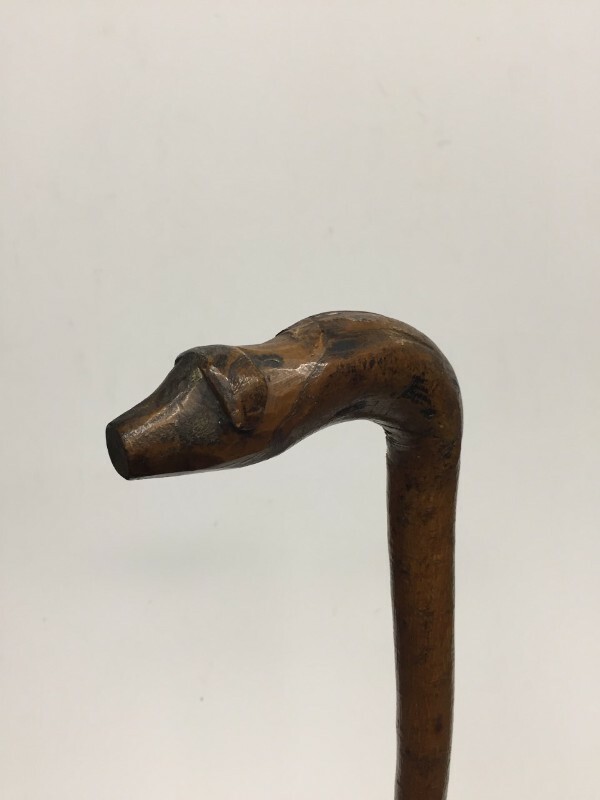 The dog head cane was never painted and was actually being used daily as a cane. It has a beautiful, rich patina. The Eagle is in its original black paint and red mouth interior. It is very rare to ever see the inside of an Eagles mouth. Sold separately. Large early Carboy bottle in great condition! Beautiful rich green color and open pontil. It measures 19” tall. Here is a very unusual Dome Top Box on its original stand and in its original paint. It is circa 1840 and has always been this way. I have never seen another one built like this before. 26” x 17” x 35” tall. It is all together as one piece. Here is an original Tin Chalk Board with the original advertising still intact. 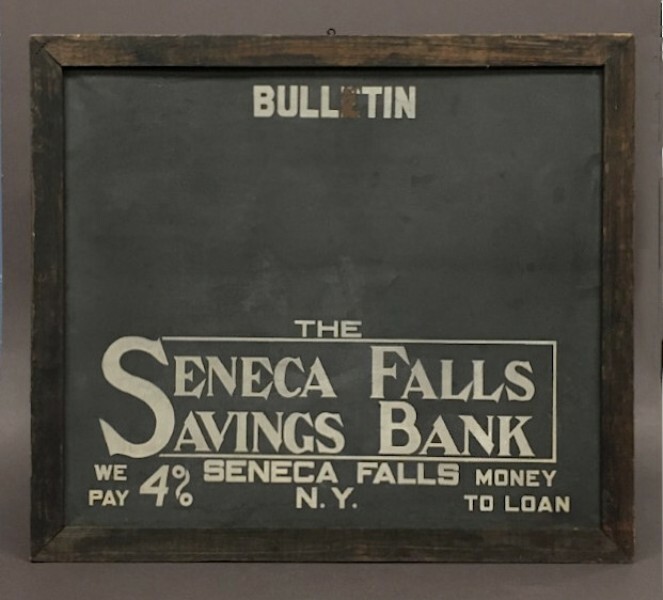 It is from “Seneca Falls Savings Bank” Great condition and it measures 30” x 26”. Early 19th century four drawer country chest with a simulated French foot. It is Birch with a nice old red wash and it measures 40” x 19” x 41” tall. All original except the brasses. What a great New England look! 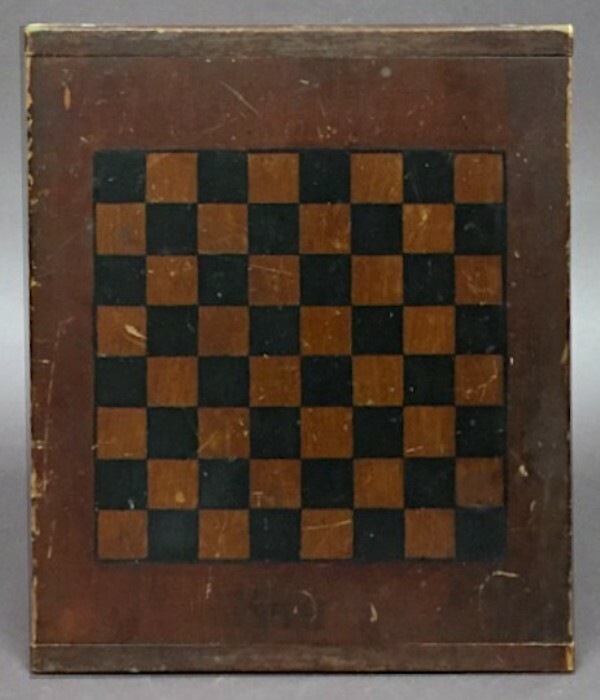 Here is a 19th century gameboard in its original three color paint. It has breadboard ends and measures 19” x 16” Excellent condition! 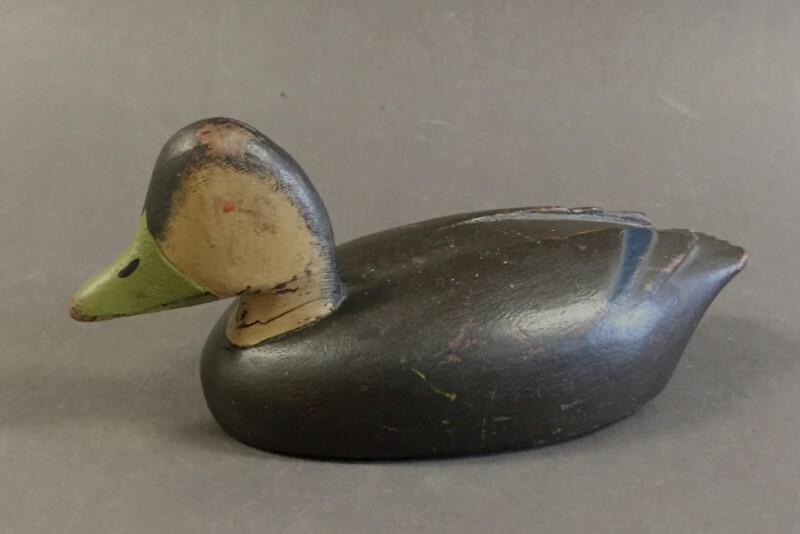 This is a Smith Falls, Ontario Black Duck Decoy in its original paint! 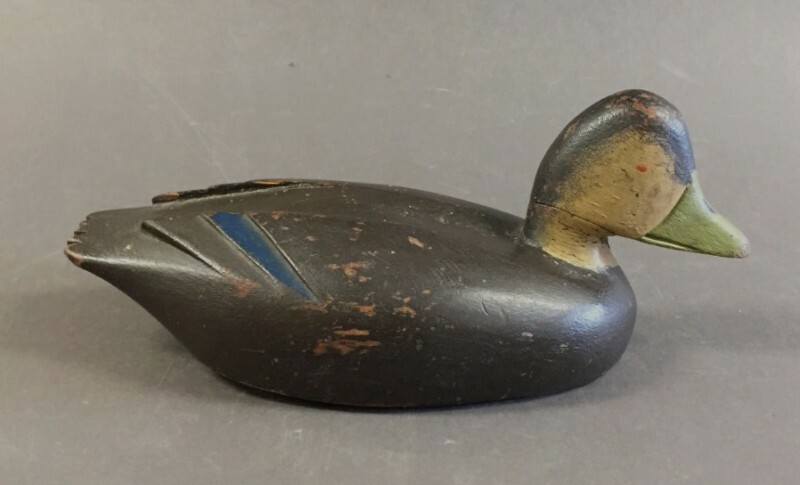 It is circa 1940 and measures 14” long. Probably done by one of the Nichols family members. Here is the largest and gutsiest sewing stand of this type that we have ever had. It stands just over 13” tall to the top of the bold turned finial on top of the pin cushion ball. It is circa 1840 and still retains its original heavily crazed colored varnish surface. The base measures 6 ½” x 6 ½” and has one drawer. It is complete and all original and square nailed too. I wish you could see this in person as the photos don’t do it justice. Dome Top Box in lively original paint, circa 1840. Great patterns, color, and dry surface too. It is all original and in great condition except that the lock plate has been changed over the years. It measures 26” x 14” x 13” tall. 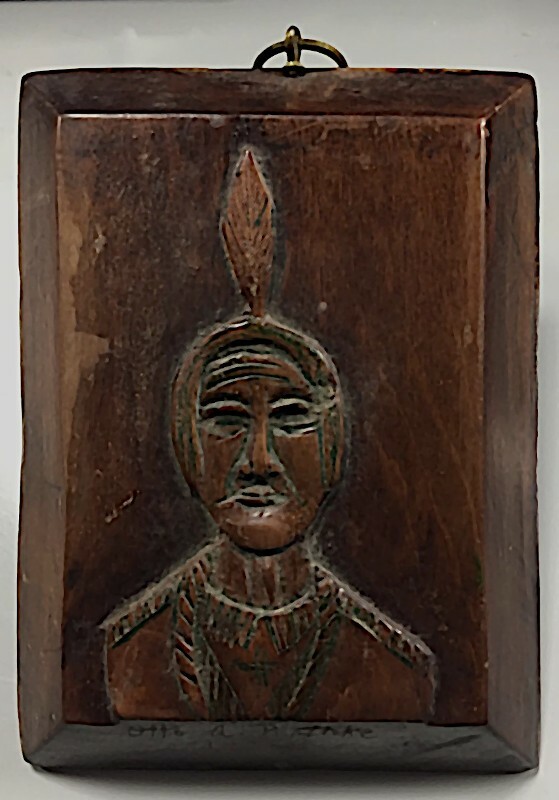 Here is a really cool 19th century folk carving of an Indian. Supposedly “Sitting Bull” It is relief carved on a chunk of walnut with beveled edges. It is signed on the bottom edge, “Otto A. Rathke 1873”. On the back is written, “With Love to Carmen Marge Oct. 1873 / Sitting Bull Oct 1873 / Otto A. Rathke”. It measures 6 ½” x 5”. Original surface. NICE! Here is a nice early smaller size Adirondack Pack Basket. It is circa 1910-20 and in very good condition with a very pleasing patina. It measures 13” x 8” x 16” tall. Good and sturdy. Here is a 19th century barrel with a bit of an unusual form and two handles. It measures about 18” in diameter x 28” tall. It has a great old paint surface of dry putty colored paint over dry red paint. It is very sturdy and strong too. 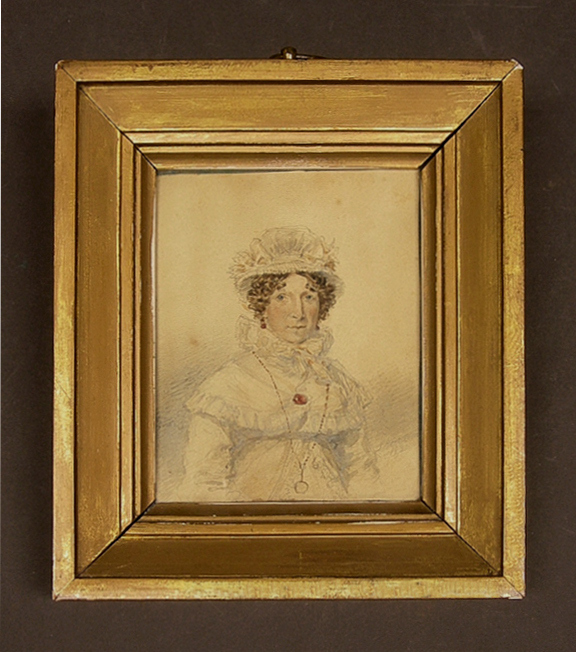 Here is a very well done miniature watercolor portrait of a woman. There is an extreme amount of detail throughout and probably the original worn gilt frame too. It is signed and dated in the lower right. I can’t make out the name, but the date is 1821. It measures 7” x 8” including the frame. Note the jewelry, the ruffles, and the glass on a chain. Folky Hooked Rug in very pleasing colors. It shows two classic baskets of flowers, one at each end. It is all mounted and ready to hang and it measures 28” x 36” and is in great condition. A nice handmade folk art Train Model. Probably made by someone that worked on that train. It is all original including the unusual paint. It is lettered LACKAWANNA on the sides of the coal tender and it measures 28” x 6” x 7” high. It is circa 1940 and in excellent condition. Rare 18th century Aquatint dated 1789. “THE NORTH WEST OR DAVIS’S STREIGHTS WHALE FISHERY” “Published May 1st 1789 by John and Jofia Boydell, No. 90 Cheapfide London.” / “Robt Dodd delint & Sculpt” Strong colors and beautifully framed and matted. It measures 34” x 24”. Early 4 slat Ladderback Chair in 19th century paint. What a great look! The height of the back is almost 39” tall. This is a very sturdy chair! 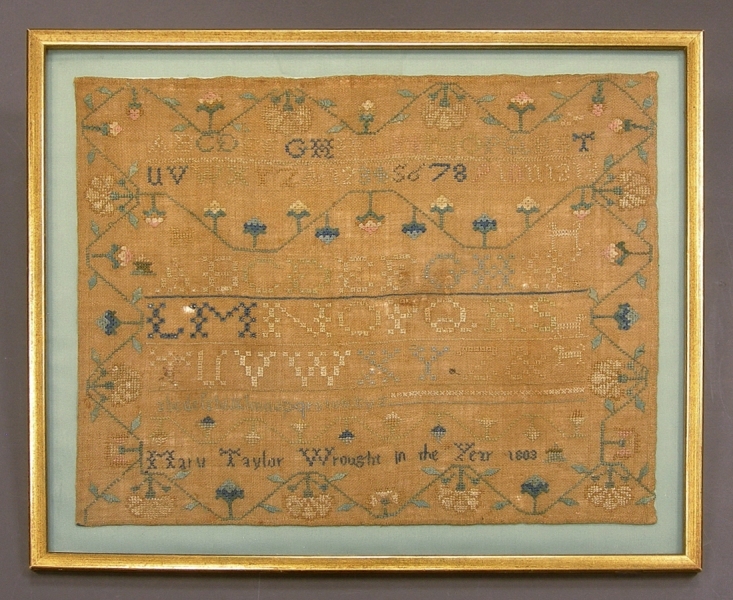 Very early 19th century American sampler signed “Mary Taylor Wrought in the year 1803”. This piece has beautifully done borders with floral decorations and small animals too. It measures 19” x 16” including the frame. It is very interestingly designed and wrought. 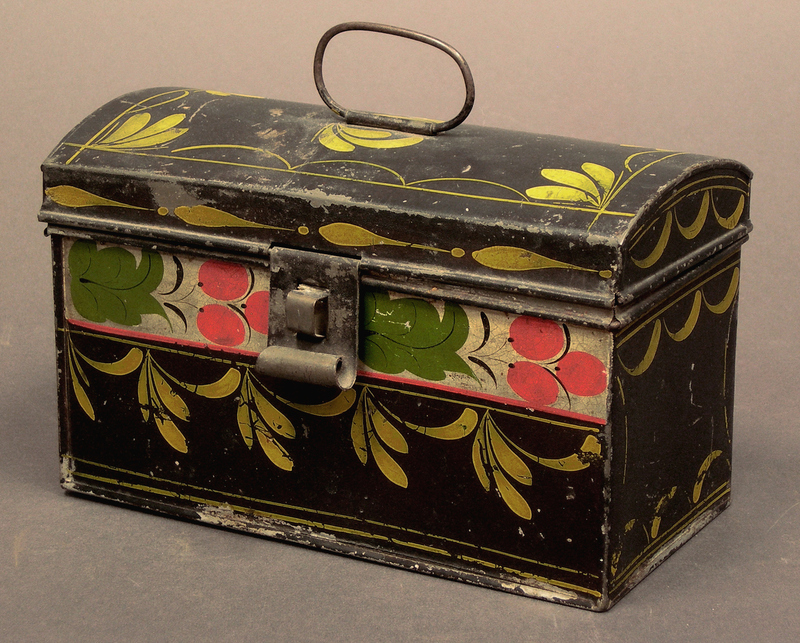 American Toleware box, circa 1835. Nice original paint and in very good condition too. It measures 8” x 4” x 5” high. Historically significant early sampler in a great old lemon gold frame. This is the only sampler I have ever had or seen that is marked with a Western N.Y. town name. 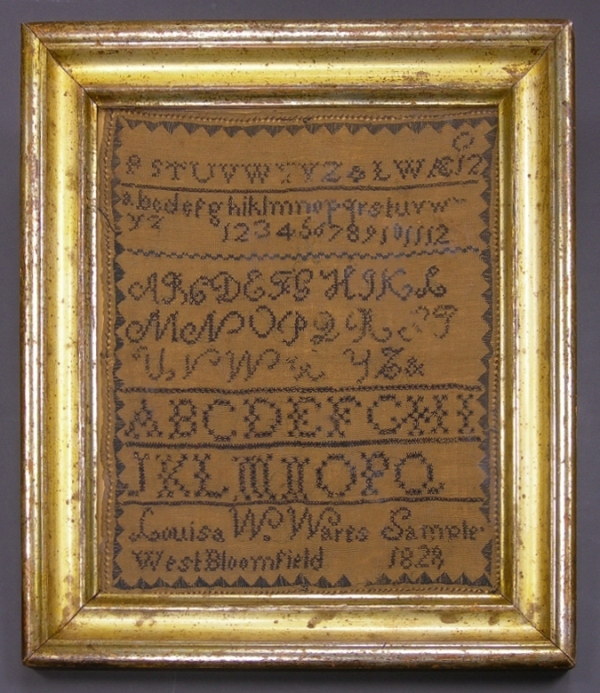 It is signed, “Louisa W. Wares Sampler West Bloomfield 1828”. It measures 14” x 16” including the frame. I have had this in my own collection for well over 25 years. 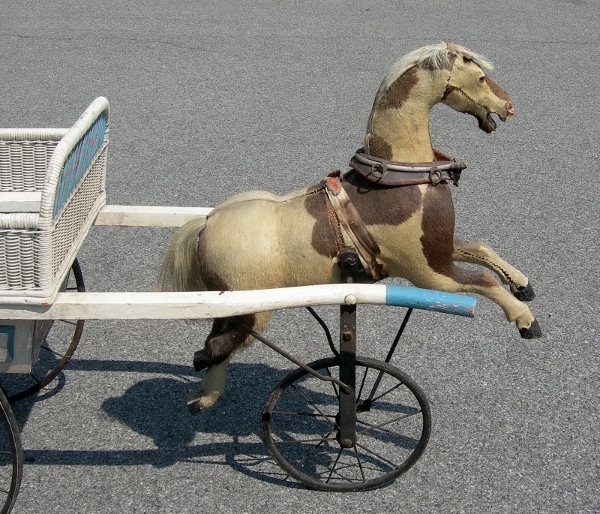 West Bloomfield is near Rochester, N.Y.
Rare early Velocipede Baby Carriage. We have never had one of these before so it was very exciting to find this one. When the carriage is pushed in either direction the original full bodied horse hide covered horse rocks up and down. The woman that we bought this from bought it over 45 years ago while driving down Delaware Avenue in Buffalo. It was in the window of a very exclusive children's clothing shop that was going out of business. She stopped and asked if they would sell it to her and lucky for her they said yes. She has owned it all this time. It measures a large 62” long from horse hoof to back handle.. You just don't see these offered for sale very often. WOW! 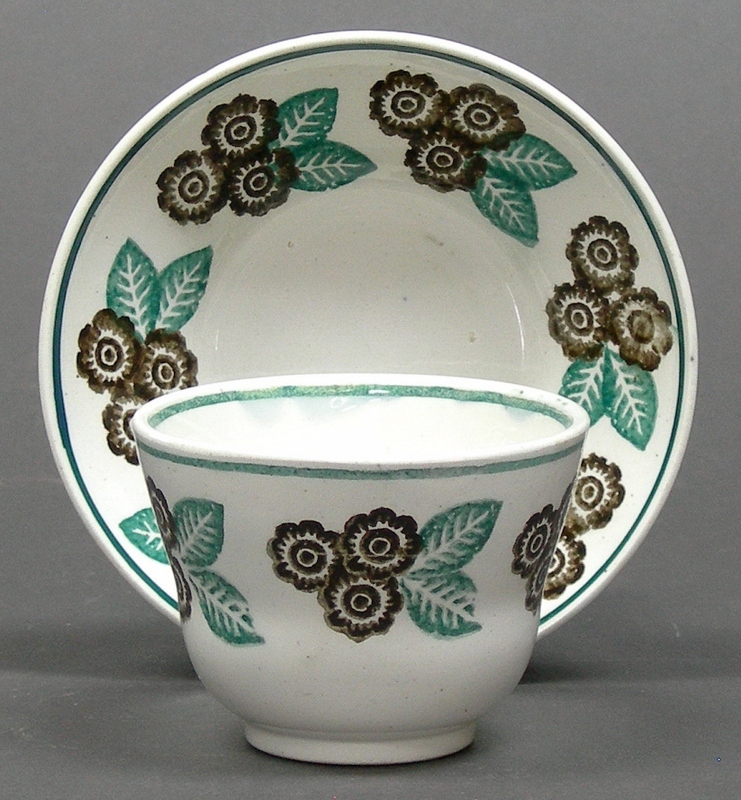 Early 19th century Stick Spatter Handless Cup and Saucer. Great colors and condition. 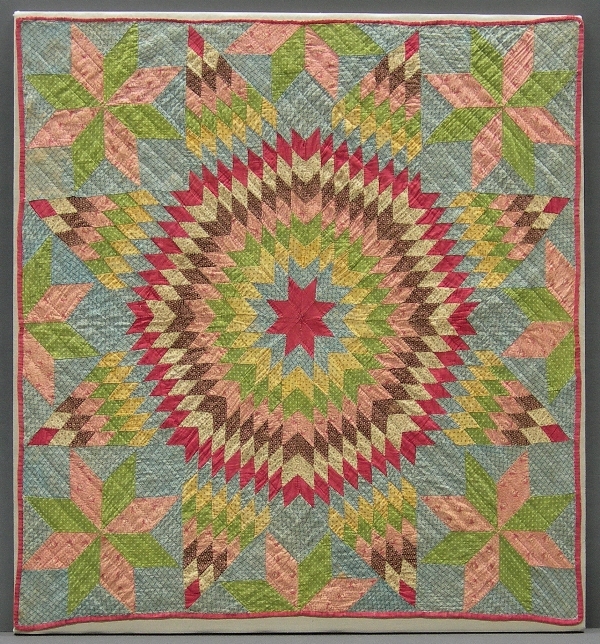 Especially nice and rare 19th century crib quilt. Great condition and vibrant colors! It measures 34” x 37”. 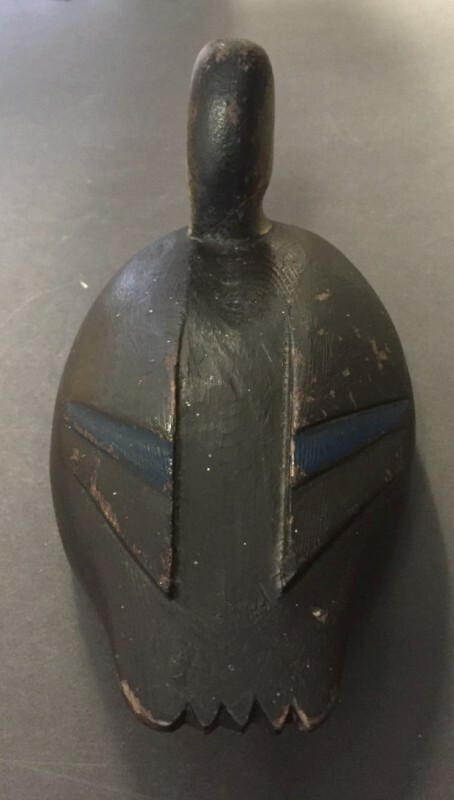 This was originally found in a home in Lockport, N.Y. Here is a large green/amber 19th century Demijohn bottle in excellent clean condition. Sparkly color too. It measures 17” tall. Here are four framed early Trade Cards that were all printed by “Clay & Richmond / Buffalo” They each show chubby men playing Baseball. The tow on the top advertise, “MERCHANTS GARGLING OIL” The two on the bottom advertise “W.H.&S.V. Lines / Boots & Shoes / Rochester, NY” They are beautifully framed and ready to hang. It measures 12” x 16” including the frame. We try to change our photo gallery about every 3-4 weeks, so please visit often. If you would like us to notify you whenever we change the site throughout the year, just email us your e-mail address and we will keep you posted.